Painting Acrylic on Canvas | 29" x 29"
Painting Acrylic on Canvas | 24" x 28"
I try to showcase positivity and liberal thought process in my paintings. I try to opine through my paintings and be in tune with the rhythm of the universe. When I am making a figurative art work, I try to feel the lines and the pose. This feeling of being one with my art helps me in bringing out the details in my creativity. I want the world to acknowledge the symmetrical beauty of the universe, encapsulated in the form of a woman. My mystical lines, surrealist shapes, perceptive designs which are painted with soft colours that play a little game with lightness and darkness, add playful elements of mass, volume and texture into my art. I am hoping that my creative pieces break through the peripheral vision of the viewer and my audience understands the hidden story within my work, making the power of my art truly limitless. 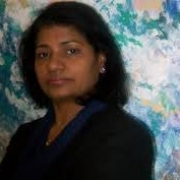 Ella Prakash started her professional art career in 1982. Being born in Bahrain, she had her glimpse of world culture and started to make sense of the world through drawing and painting. She used a variety of mediums to express her feelings. Her acrylic paintings present the world as if seen through a prism, with bold colors parceled out into geometric forms that offer fleeting glimpses of a surreal future. With an eagerness to express her thoughts to the world, Ella’s brushes started to create unique pieces in post modern and contemporary art forms. Each frame of hers is an exceptional work of various elements like abstract, figurative and geometric designs. Ella was honoured at the 10th International American Juried Art Salon Award, along with being awarded at the TOPTEN International Art Competition and Women in the Arts (Artrom Gallery Rome –Italy). She has showcased her paintings in solo as well as group exhibitions in Delhi, Mumbai, Bangalore, Bahrain, USA, UK and Germany.